I’m sure we are all looking ahead to Grandma’s marathon on the 16th. Here is a reminder that you can do your carb loading right here in Two Harbors the night before, at the Third Friday Community Supper. 5:00-6:30 p.m. This month’s Menu: Marathon Special Spaghetti with Meatballs, “Olive Garden” salad, Garlic Bread, Dessert and Beverage. No cost and everyone is welcome! There’s nothing Ordinary about it! The Season After Pentecost is also called Ordinary Time or Kingdomtide, the period in the Christian calendar extending from the day after Pentecost Sunday to the first Sunday in Advent. By tradition, the Sundays after Pentecost are numbered. The first Sunday after Pentecost is Trinity Sunday, for which the liturgical color is white. The last Sunday for this period is Christ the King Sunday, for which the color is also white. The color for the rest of the Season After Pentecost is green. This season focuses on the significance of the church as a sign of God’s continuing presence and activity in the world. So, why is it called Ordinary Time? Is it because there isn’t much happening in the church at this time of year? No, the word Ordinary in this context probably comes from the word ordinal, meaning numbered, since the Sundays in the Season After Pentecost are numbered. It certainly doesn’t mean that there is nothing special about this particular church season. No, this is a season when, free from the peak moments and attendant hustle of the major church holidays, we can truly put our faith to work, when we can celebrate our relationship with Christ by living it fully in the here and now. When you think about it, there is nothing ordinary about that! Did you notice our new tree? A group of United members, ably led and instructed by Kim Leon, installed a new crabapple tree in front of the church on Saturday, the 26th. It was a beautiful morning, and this is going to be a beautiful tree! It is fitting that this is an apple tree. There have often been comparisons and allusions to Jesus Christ as an apple tree, and a famous poem called “Jesus Christ the Apple Tree” dates to 1761, in England. 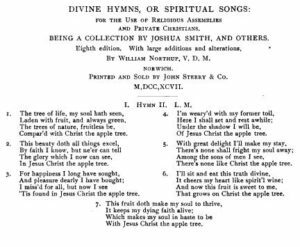 Since then, this poem has been used in hymns and anthems by composers from the 18th century to the present day.